In November 1884 Masons living here who regularly made the 18-mile journey to Henrietta for meetings petitioned the Henrietta Mason Lodge for a new lodge to be located in Wichita Falls. In December the Grand Lodge of Texas granted a dispensation for the Wichita Lodge No. 635. The first meeting of Wichita Lodge was January 5, 1885, in the hay loft over Soule's Livery Stable. The original officers were W. J. McDonald, E. W. Foster, J. C. Black, W. N. Barker, C. E. Reid, W. E. Brothers, J. A. Williams, and J. S. Moody. 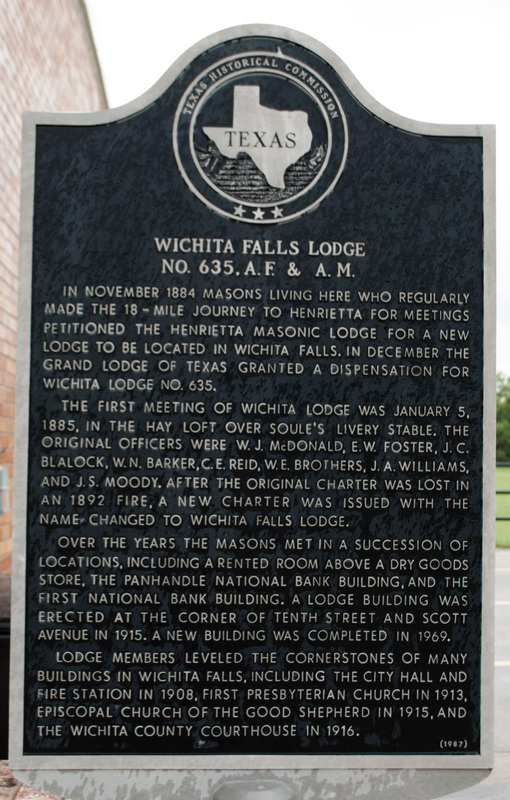 After the original chapter was lost in an 1892 fire, a new charter was issued with the name changed to Wichita Falls Lodge. Over the years the Masons met in a succession of locations, including a rented room above a dry goods store, the Panhandle National Bank building, and the First National Bank building. A Lodge building was erected at the corner of Tenth Street and Scott Avenue in 1915. A new building was completed in 1969. Located on 3388 Barnett Road, Wichita Falls, Texas 76310. GPS coordinates: 33-degrees 52' 58.0" N -98-degrees 34' 42.2" W.